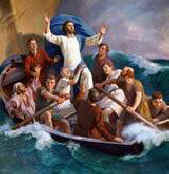 Like Jesus on the boat we are exposed to our very own storms. To humans it is quite normal for things to go wrong, in fact it can be the norm. We long for the peace and calm that only Christ can give. We cry out to him, help us hour of need. We know that you will lead. Stretch forth your hand and say to the spiritual wind and rain, “Peace be still”. Instantly there was peace, tranquillity and sunshine. We forget sometimes to align ourselves with the living word. Let Jesus calms over very own personal demons and personal storms of life.